Twenty-seven former Miami players have logged at least one game in the NHL, and several more could be in line to join that list in 2016-17. 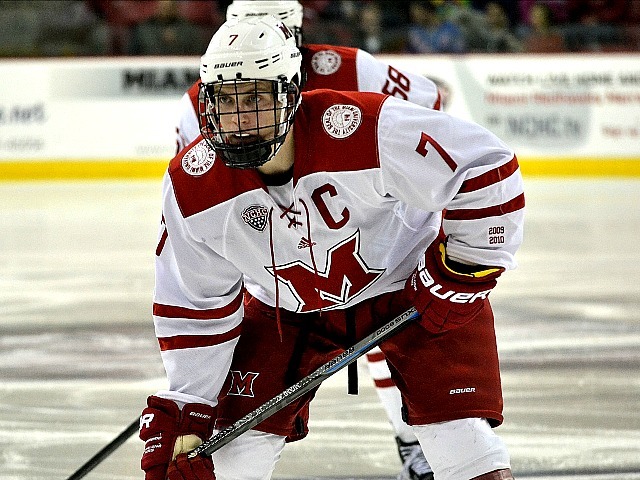 BoB takes a look at the RedHawks’ pipeline to the world’s top hockey league, and the players that could be the Next In Line. Center Pat Cannone (photo by Cathy Lachmann). 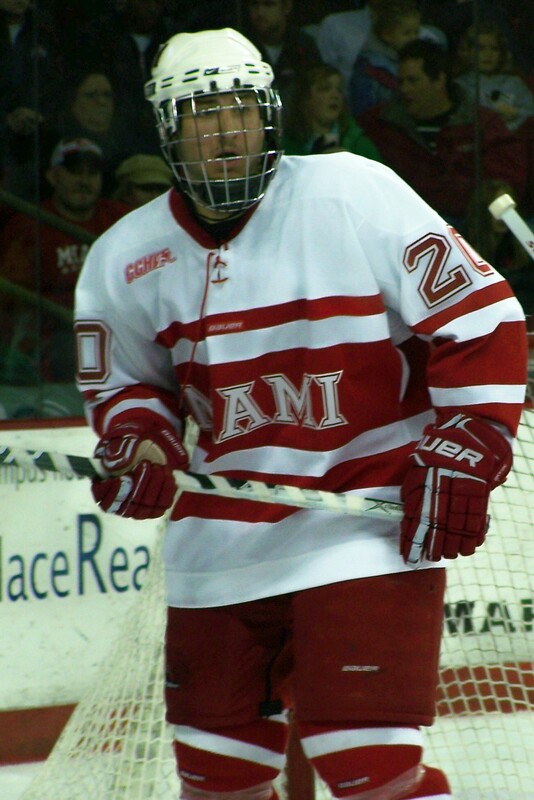 C Pat Cannone, Minnesota Wild – Cannone was an iron man while at Miami (2007-11), as he recorded 133 points (45-88-133) and 83 PIM in 166 games while not missing a game his entire collegiate career. The captain of the AHL Chicago Wolves tallied a career high in points (55) and goals (20) last season. The 30 year old should anticipate a call-up to the Wild this season considering Minnesota will likely be in need a fourth line center. Cannone signed with Minnesota in the off-season and would play for AHL Iowa if he doesn’t make the big club. Defenseman Vincent LoVerde (photo by Cathy Lachmann). D Vincent LoVerde, Los Angeles Kings – LoVerde lit the lamp 11 times last season as captain of the AHL Ontario Reign, while also dishing out 21 assists for a career best 32 points in just 56 games. LoVerde won the Calder Cup two years ago, while adding AHL All-Star to his list of achievements in last year’s campaign. The Kings have an experienced winner in the minors in LoVerde if they want to add him to their top six. Worst case: he’ll Reign in Ontario again as captain. Right wing Riley Barber (photo by Cathy Lachmann). RW Riley Barber, Washington Capitals – The Hersey Bears rode the success of Barber’s first year with the team, finishing runner-up to champion Lake Erie in the Calder Cup. The 22-year-old was fourth in the AHL in goals (26) and was in the top 20 in points. The Pittsburgh native can rack up points by beating goaltenders in creative ways, whether it be full strength, on the power-play, or even shorthanded. Center Austin Czarnik (photo by Cathy Lachmann). 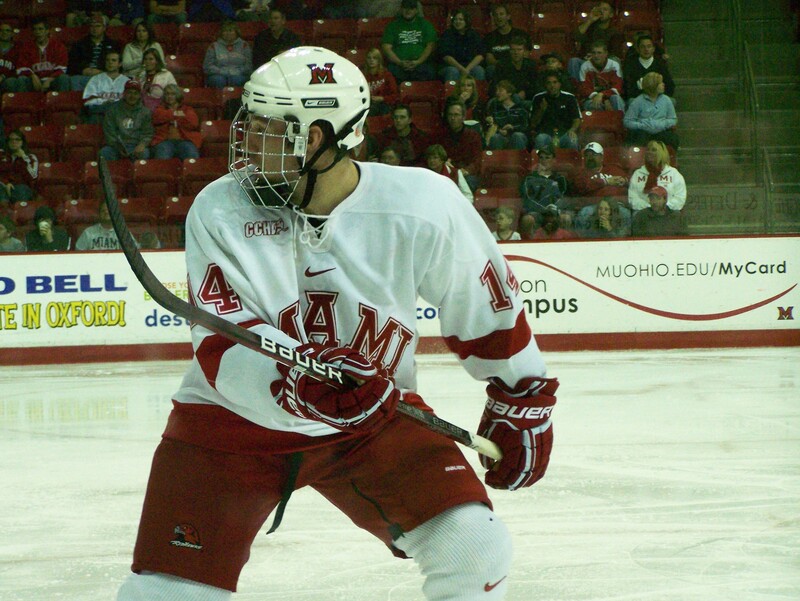 C Austin Czarnik, Boston Bruins – In Czarnik’s four seasons at Miami, he totaled 169 points, fifth most in school history, but he didn’t stop there. 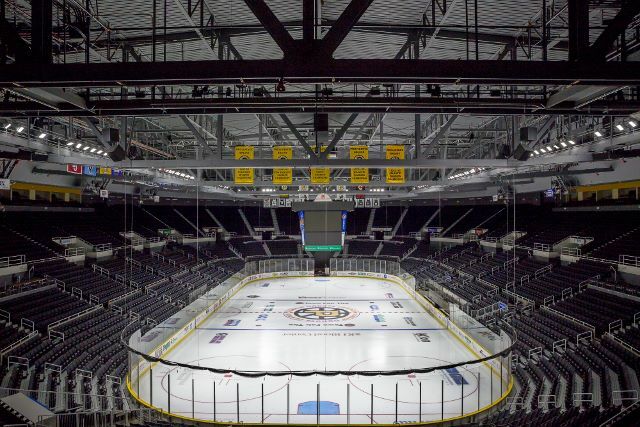 In his rookie season in the pros, Czarnik ranked seventh in the AHL in total points (61) with the Providence Bruins, one point behind former Miami star Andy Miele in seven fewer games. The American centerman was plus-17 in his 2015-16 season, but might have to wait to crack the top 12 forwards considering Boston signed free agents C’s David Backes and Riley Nash. You probably didn’t miss us even though we haven’t posted since Miami got pretty boring to watch about six weeks ago. We haven’t found this season easy to watch, either. Anywho, Blake Coleman is back! And the junior from Texas netted his 11th and 12th goals of the season to lift Miami to an emotional win over fourth-ranked St. Cloud State at Steve Cady Arena last night. Coleman, who had not seen action since injuring himself (we believe he broke his collarbone) in a game on December 6 against Denver, was easily the best player on the ice. He added an immediate boost of energy and seemed to infect the RedHawks with his sense of purpose and leadership — something that’s been sorely lacking since he left the lineup. He was hitting, backchecking, hustling, creating turnovers … and scoring. Frankly, it was one of his best games since his freshman year. If he can raise his level of play, and lift the team around him, this could be a good sign as the season nears completion. Austin Czarnik also seemed affected by Coleman’s presence in the lineup. On the first line with regular mate Riley Barber, Coleman was inserted alongside the two of them creating matchup nightmares for SCSU as that line accounted for three of Miami’s four goals and was a handful all night for the Huskies. For Czarnik he scored his 11th goal of the season and assisted twice giving the junior captain a season’s line of 11-30-41. Barber also assisted on Coleman’s first goal of the night, his 20th, in an otherwise quiet night for the sophomore sniper from Pittsburgh. Sophomore goaltender Jay Williams earned just his fifth win of the season evening his record at 5-5. He wasn’t great, but he did enough to enable Miami to record its second win over SCSU this year. Consider. Miami has only 11 wins this season but they have beaten an impressive list of teams with far better records than the RedHawks. Miami has beaten North Dakota, St. Cloud (twice), Wisconsin, Denver and Ohio State (twice) who is somehow 15-10-3. Oh, wait. I know. It’s because duhOSU has the 46th ranked strength of schedule in college hockey. For the record, Miami has played the 15th most difficult schedule in the nation and sits at 11-15-3. Can one player make a difference? Well, it certainly looked that way last night. Miami put forth a level of effort, a much higher “compete level” to paraphrase CBS Sports analyst Dave Starman, that I haven’t seen in months. Will this be the start of a late season run that could carry this team into the NCHC playoffs and save the entire campaign? Or will this just be a blip on the radar? While I’m not completely sold on this as a bellwether moment, I’m at least curious for one more night to see how this team responds. After one period of play from Omaha, Neb., #8 Miami leads Nebraska Omaha 1-0. Bryon Paulazzo had the Miami goal on the powerplay assisted by Austin Czarnik and Riley Barber. Blake Coleman is strong. He threw his weight around the ice and can seemingly protect the puck with just one hand on his stick. Austin Czarnik is the real deal. There is a zip on his passes. He doesn’t just make a pass, he means it. It’s impressive to see how accurate, and powerful, his passes are. Additionally, he has a very active stick always getting it in the passing lanes and is really impressive with the puck. Good defensive period for Miami. UNO’s top line of Zombo, Archibald and Walters were relatively invisible. Taylor Richart is a silent assassin. He is everywhere and he is no where. Always in position, always on the puck. His 150 foot slapper that drew a faceoff on the PK was impressive. Riley Barber looks more aggressive tonight. There does appear to be more space tonight than previous games and he is making the most of it getting shots to the net. His shot and subsequent rebound found Paulazzo’s stick for Miami’s goal. Max Cook and Ben Paulides look a little shaky. I think they could both use a boost of confidence. UNO’s transition game might be the only way they score tonight (aside from a powerplay). Their speed is challenging Miami’s D to be alert and the Hawks’ forwards to backcheck — which Czarnik, in particular, has done well. With apologies to Adam Duritz and “Counting Crows,” Miami hits the road for Omaha to take on old CCHA foe Nebraska Omaha in a weekend NCHC series. The Mavericks, you may recall, were conference mates with Miami from 1999 until leaving the CCHA in favor of the WCHA in 2010. 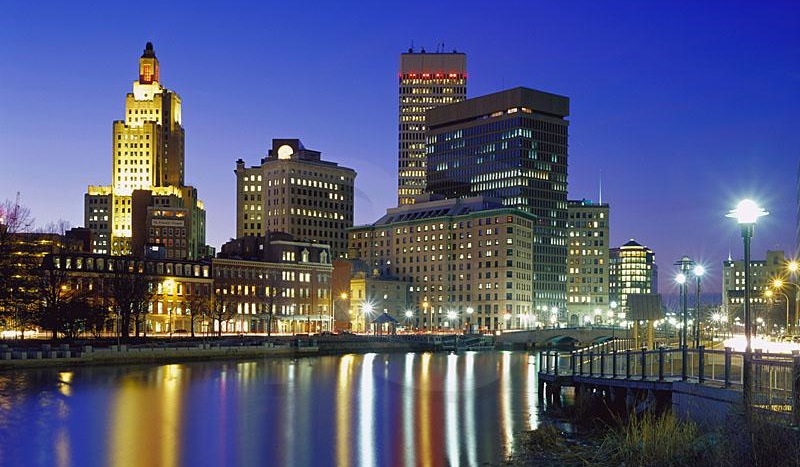 That, of course, was an ill-fated and perhaps short-sighted move, as college hockey underwent enormous realignment after the announcement that the Big Ten would field its own hockey conference in spring 2011. 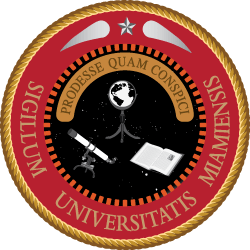 And, after all was said and done, UNO and Miami, along with charter schools Colorado College, Denver, Minnesota-Duluth and North Dakota would announce the formation of the National Collegiate Hockey Conference in summer 2011. After two more seasons in the CCHA and WCHA respectively, Miami and UNO once again find themselves facing off as conference rivals. This weekend marks the first time the programs have met since February 20, 2010 in Oxford when UNO knocked off then #1 Miami 4-2 in head coach Dean Blais’ first trip to Steve Cady Arena. Speaking of Dean Blais, his resume speaks for itself. But, Miami head coach Enrico Blasi summed it up nicely during his weekly press conference. 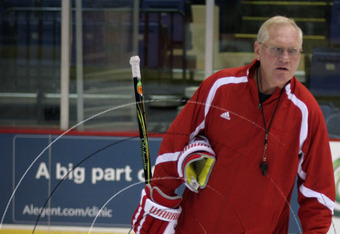 One of the most decorated American amateur coaches in recent history, Blais spent 10 seasons behind the bench at North Dakota, where he compiled a record of 262-115-34 and won two national titles (1997, 2000) before leaving to take an associate head coaching job with the Columbus Blue Jackets. After spending four years in Cowtown, also serving as director of player development, Blais went back to his amateur roots where he was hired by the Fargo Force of the USHL to be their head coach, and was eventually lured back to school in 2009 by new Omaha AD Trev Alberts. In going to Omaha, he took over the reins of the program from long time head man Mike Kemp, who is largely regarded as the Father of UNO hockey. Blais has also long been involved with USA Hockey winning a gold medal in 2010 with the U-20 World Junior team. The two-time Spencer Penrose winner (1997, 2001) has an all-time record of 342-189-49 over nearly 15 seasons in college hockey. junior forward Josh Archibald who leads the team in goals (9) and is tied with Walters atop the team’s scoring list. Archibald’s name should be familiar to some as he skated on Team USA’s 2012 U-20 team which failed to medal a year after earning bronze in Buffalo. Others to make note of include junior forward Dominic Zombo (5-5-10) and senior Brock Monpetit (6-3-9) who rank third and fourth in team scoring for UNO. Overall, the Mavericks are second in the NCHC in scoring averaging 3.08 goals per game. Miami at 3.42 goals per game leads the way in the league with 41 goals though St. Cloud is averaging just a shade more at 3.50 goals per game in two fewer contests played. Defensively, the Mavericks are allowing 3.25 goals per game as they have struggled to find consistency in net. Lately however, UNO has gotten better goaltending from junior Ryan Massa and freshman Kirk Thompson having allowed more than three goals just once over their past six games. Massa and Thompson are very similar goaltenders. Both are around six feet tall and possess nearly identical numbers. For instance, both goaltenders are 3-2 with goals against averages north of 3 and save percentages below .900. In contrast, Miami allows just 2.08 goals per game and sophomore Ryan McKay leads the nation with three shutouts and has posted sterling 1.74/.943 numbers. However, because McKay has played the last four games for Miami, I would not be at all surprised to see McKay in net Friday night and fellow sophomore Jay Williams (2-2/2.75/.905) between the pipes on Saturday. For Miami (7-4-1, 2-2 T5th NCHC), the eighth ranked RedHawks enter the weekend having faced two top 15 teams in a row after splitting series with NCHC foe St. Cloud State and Big Ten opponent Wisconsin just last weekend in Oxford. That stretch has catapulted Miami’s strength of schedule to the top of the heap. This week’s KRACH ratings show Miami’s SOS sitting at #1 having played the most challenging schedule in the land. Overall, the offense is simply not delivering against top teams as they have managed just 13 goals in their last six games against ranked opponents including just seven goals total over the past two weekends. As teams focus on shutting down the top line of Riley Barber, Austin Czarnik and Jimmy Mullin, Miami must have secondary scoring from throughout the lineup. To this point, most of that scoring has come from junior Blake Coleman as he has netted seven goals which ties him with Czarnik for second on the team. Last season, Coleman scored nine goals so he’s well on his way to surpassing that total as his game continues to improve. But, outside of Coleman’s efforts, only two other RedHawks have scored at many as four goals (Alex Wideman and Anthony Louis). Tired of splitting, I think Miami gets a much-needed league sweep this weekend in Omaha. And, we’ll be live tweeting from the press box of the Century Link Center @miamihockeyblog and will have updates and recaps immediately following Friday night’s game. Miami All-Access has the call both nights along with local radio coverage at 1450-AM (Friday only) and 1490-AM (both nights). In one of their most complete games of the season, the #7 Miami RedHawks went into the Herb Brooks National Hockey Center in St. Cloud, Minn. and handed #3 St. Cloud State their first loss of the season shutting out the Huskies 2-0. The win was significant as it was St. Cloud that knocked Miami out of last year’s NCAA tournament winning a 4-1 Midwest Regional final in Toledo in front of a crowd that would make duhOSU’s crowds at Cheap Furniture Arena look huge. Miami got on the board first about halfway through the first period as freshman defender Matt Joyaux recorded his first collegiate goal on a nifty pass from junior Alex Wideman. 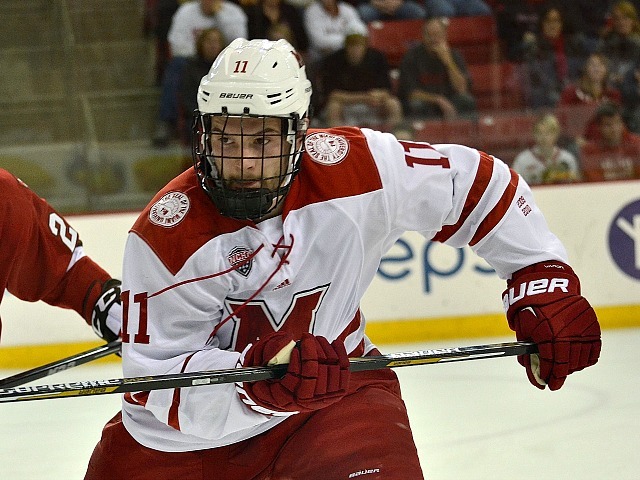 After Miami won a puck battle at the SCSU blueline, sophomore forward Sean Kuraly muscled the puck into the offensive zone where Wideman collected the puck along the boards and centered a pass to a trailing Joyaux who one-timed a low shot on the ice past Husky goaltender Ryan Faragher for what turned out to be the game-winning goal. In the third, Miami collected an insurance marker as sophomore Riley Barber connected on his ninth goal of the season by firing a wrist shot off a draw in the SCSU end. Junior captain Austin Czarnik won the draw cleanly and directly to Barber, and he made no mistake ripping a shot past Faragher on the far side. Sophomore netminder Ryan McKay made 31 saves to record his second consecutive shutout and sixth of his career and the Miami penalty kill went 5-for-5 and forced many of the SCSU chances to the outside though the Huskies certainly had their share of good scoring chances, but were simply unable to find the back of the net. Miami will still need to focus on limiting chances down low tonight and for the rest of the season as the young defense corps continues to grow. Miami and St. Cloud will finish the two-game NCHC series tonight from the National Hockey Center. Faceoff is at 8:07 PM EST and the game can be heard via Miami All-Access. The Huskies also offer a pay video feed from their website, scsuhuskies.com. Weekend Preview: What’s a Golden Griffin? Miami had quite the schedule to start the season: weekend series against in-state rival Ohio State, #5 North Dakota and this week’s #3 team Providence. 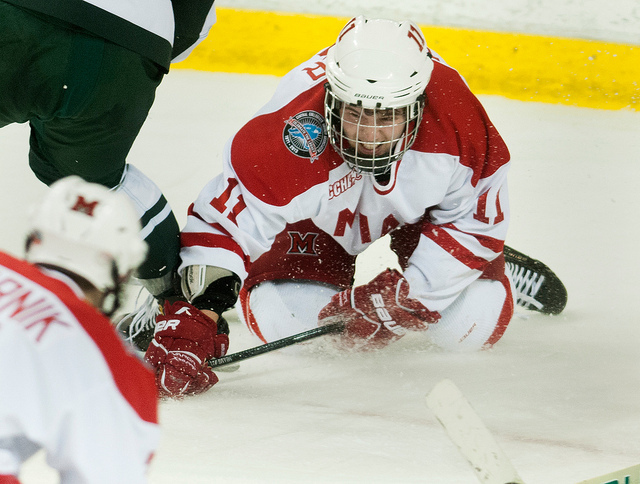 Miami gets a break and faces off against the Canisius Golden Griffins this weekend. It will be more than just a physical test on the ice, but a mental one as well. Miami won’t be able to help thinking “we should crush these guys” and the fans will have that same thought as well. I know I do. 4-0-0 all time against Canisius? 23-3 all time score over them? 11-5-0 all time against Atlantic Hockey teams overall? Don’t let it go to your heads, boys. All of these facts don’t mean this will be an easy weekend. Through 3 games, Senior Defenseman Ben Danford leads the Golden Griffins with 5 assists and 5 points. Keegan Asmundson stopped Denver, and led the Golden Griffins to a 4-1 win last weekend. 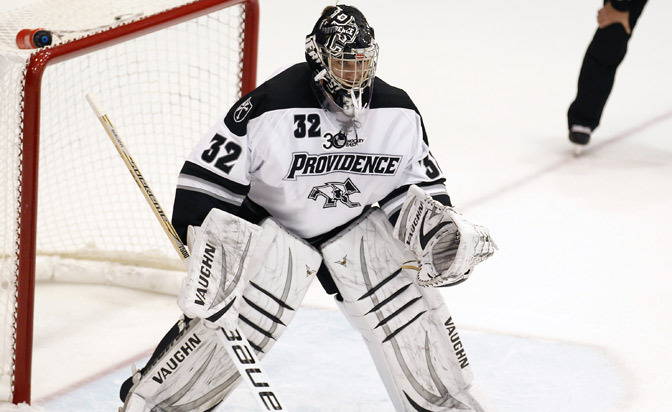 He was named Atlantic Hockey’s goaltender of the week for his effort. But what are we going to see from Canisius on the ice? It’s going to be interesting which team shows up – the team that beat 17th ranked Denver 4-1 in Magness Arena? Or will it be the team that has lost to Air Force AND Niagara on opening weekend? Riley Barber is first in the nation in scoring with 12 points, and his 8 goals are second in the nation. Austin Czarnik has 11 points, had 5 assists last weekend and was named NCHC Offensive Player of the Week. Sound like a broken record? Well, it is, but I’m happy to be talking about leading scorers at this point of the season. Hopefully these two guys will be in those same positions at the end of the season and we’ll be talking about Hobey Baker Finalists again. Be sure to follow us on Twitter, as we will be giving you what we can during this weekend’s games at @MiamiHockeyBlog. Enjoy the hockey, everyone!